Onboarding is a key step of your recruitment strategy to create employee loyalty and advocacy on the long term. Yet, being able to integrate new hires and making them productive from day one can be a challenge. 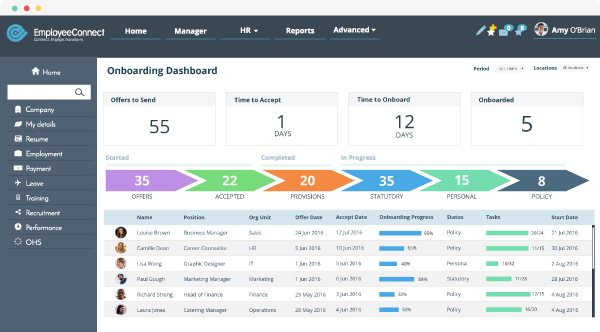 EmployeeConnect provides a holistic approach to the management of the onboarding and integration process that allows new employees to deploy their full potential. EmployeeConnect allows you to structure the steps and tasks necessary to get new employees started on the right foot. Automate low value tasks so that you can focus on the development of new staff. Traditional paper admin documents can be digitised and completed by new employees before their first day. Even before their first day, new recruits can share their personal information with your HR department. They connect to their user session, complete their details and are ready to go. The result? They can fully enjoy their first day and focus on what they were hired for. 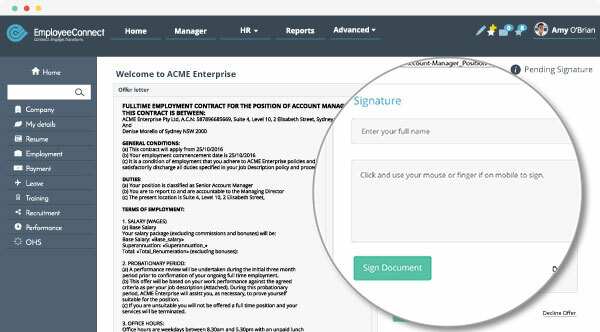 With EmployeeConnect, forms and documents can be completed online. Online signatures allow new hires to review and accept their letter of offer directly from their mobile phone, tablet or desktop. No need to email, print and scan contracts. Employees receive an automatic notification when their agreement is ready. Fast and simple. Most information can be communicated online, suppressing the need for paper documents. 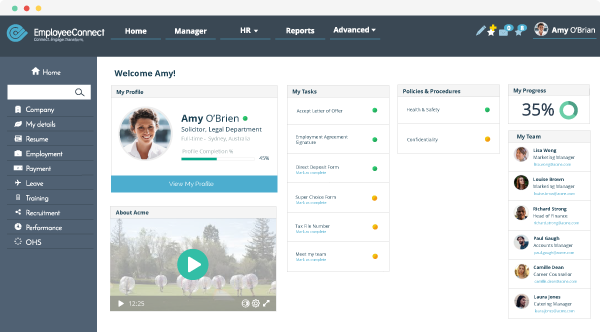 New employees can access a range of relevant information from welcome videos, or a message from your CEO, to HR policies and documents. New employees can start completing their HR details even before they have taken their first steps in your organisation. From the moment employees accept their employment agreement, they will be able to access EmployeeConnect to discover their team, learn more about your organisation, and read your company policies and other relevant content – all that with complete flexibility from their smartphone. The onboarding module guarantees an inclusive approach to make new employees feel welcome. Our security system guarantees the protection of personal information which is only accessible to authorised users. Single Sign On allows employees to use their internal password and login to access our solution.